Vader has no patience for installs. 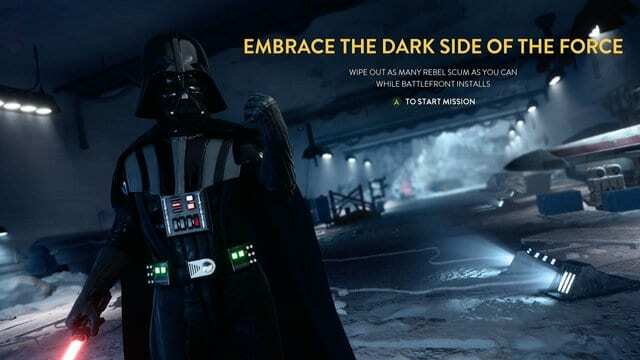 While loading Star Wars Battlefront, gamers are allowed to play as the Dark Lord of the Sith – Darth Vader while he executes Rebel Soldiers in Echo Base. In what could be the coolest install screen ever, the game familiarizes the player as a hero character, that way they can master their light saber skills before they play in a real match. Of course, since the game is installing there’s not much to see here but it’s still cool to do something while the game is getting ready. Your abilities as Darth Vader are still the same ones Battlefront players experienced with the beta. At Vader’s disposal you have abilities such as Sabre Throw and the infamous Fore Choke. You’re allowed to play as Darth Vader as long as long as the install is going on. The armored Sith has unlimited health as well, so no worries about Darth Vader getting knocked out. Has demolishing Rebel scum ever been so satisfying? Are you excited for Star Wars Battlefront? Are you ready to take on both the Rebel Alliance and the Empire after the game hits stores next Tuesday? Let us know in the comments, and of course, may the Force be with you, always.